Turbo-21 action, fatten your pigs and retire them! 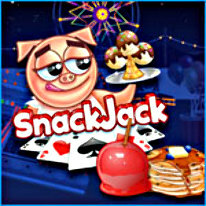 Fatten up your pigs with all sorts of carnival foods by creating blackjack hands in this unique turbo-21 game. The more blackjack hands you make, the more snacks your pig eat. Create straights and 5-card charlies for added bonuses. Once your pig is full, retire him in style to Sleepy Wallow Farms. Then take on the challenge again with another young piglet. Retire more pigs and earn more upgrades to build up your retirement community -- build amenities like a karaoke bar, bowling alley, movie theatre, tattoo parlor and even a football stadium!